Enjoying a strong performance on today’s stage of the Desafio Ruta 40, Pablo Quintanilla placed third in the event’s second full rally stage. Getting even closer to the provisional overall lead, the Rockstar Energy Husqvarna Factory Racing rider will continue battling for the top step of the podium at this penultimate round of the 2018 FIM Cross-Country Rallies World Championship. Following a well-calculated plan, Quintanilla remained fast and consistent throughout the 317km timed special of stage two. With two long days in the books, the Chilean rally star is second in the overall standings and just 44 seconds behind the provisional leader Toby Price. 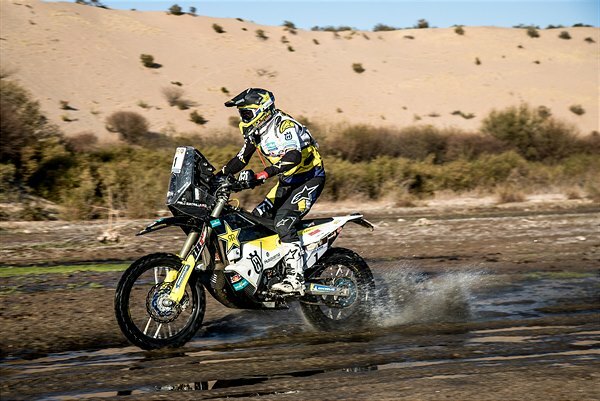 Determined to keep on fighting for the overall victory at the 2018 edition of the Desafio Ruta 40, Pablo has eyes set on extending his lead in the provisional FIM Cross-Country Rallies World Championship. After today’s long and exhausting stage, competitors will have to tackle what’s promising to be another demanding stage on Wednesday. Featuring a 336km loop around the city of Tinogasta, stage three of the rally includes a 258km timed special.